This boxed set was released on the same day that Zooropa was released, July 5, 1993. This version was sold in Virgin Megastores in Sydney, Melbourne and Adelaide in limited quantities to promote that the album was released first in those areas. It is said that only 200 copies of this release were printed, and this release is rare to find, however it did not get listed in the 2005 list in Record Collector of the Top 60 U2 collectibles, but the more common to find “Zooropa / Stay (Faraway, So Close! )“ release (also an Australian exclusive) did make that list. This package contains two 5-Inch CDs, the Australian first pressing of Zooropa, and the UK digipack pressing of “Mysterious Ways.” Both were contained in an outer box that had unique artwork on the front and back of the box. 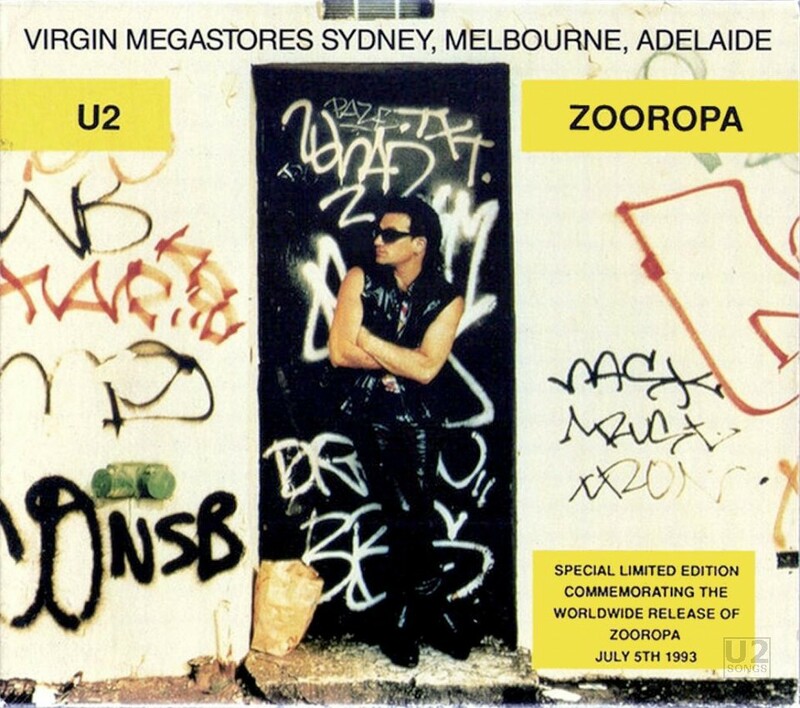 The front is labeled “Special limited edition commemorating the worldwide release of Zooropa July 5th 1993” and also lists “Virgin Megastores Sydney, Melbourne, Adelaide” above the title. The front of the box uses an image of Bono dressed as the fly with graffiti around him. The back of the box includes the logos for Island Records, Phonogram, and Virgin. Cosmo the Zoo Baby is in white on the black background, surrounded by stars, as well as the song titles on the album outside of the stars. The box is not fully sealed, and functions as a slip case which fits over the CDs, while leaving their spines open to be visible.